Posted on Fri, Mar 16, 2012 : 4:21 p.m. 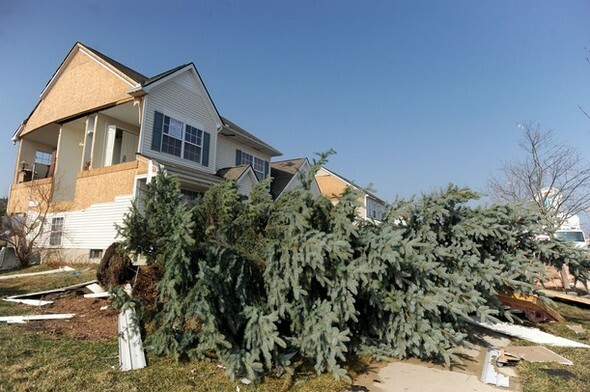 Trees are uprooted and a wall missing from the side of the Bartscht house after their home was hit by a tornado in the Huron Farms neighborhood in Dexter on Thursday, March 16. See comprehensive AnnArbor.com coverage here. Just-released 911 calls shed light on the flurry of panic experienced by Dexter residents as they witnessed a tornado rip through their neighborhoods and damage dozens of homes. The tornado, which touched down in Dexter at 5:33 p.m. Thursday, is estimated to have lasted between 25 and 30 minutes. Although officials still are surveying the wreckage, an estimated 10 homes were completely destroyed, more than 100 homes have been damaged and at least 200 residents are now displaced. "It's starting to throw debris up in the air... It's a cloud..."
"Just wanted to let you know I'm being chased by a tornado... it's for real, I saw it." "I'd like to report a tornado touchdown... It hit our house and it also looks like it touched down in the neighborhood... nearby." "A tornado has touched down over in this area. There's several houses that have been tore apart." Sat, Mar 17, 2012 : 2:55 a.m. The 911 system can record whats being said before they answer the phone? Interesting. This. Sat, Mar 17, 2012 : 4:31 p.m.
Yeah but you can clearly hear that the recording is going on as the phone rings and the callers wait for pickup by the 911 operator. Weird indeed. Sat, Mar 17, 2012 : 3:21 p.m.
No, they can't. Unless the system picks up as you are calling into the center. Which I highly doubt. I do know once the operator picks up and states the center then the system starts recording. Very weird to hear this.